In order to carry a Co-Op America Seal of Approval on your website, your company and products must meet strict criteria regarding the environment, humanitarian efforts, be cruelty free and a vehicle for social change (among other screening criteria). SimplyNeutral received the Co-Op America Seal of Approval because they are a company dedicated to these philosophies. The company was founded by Maggie and later joined by Sara. Together, this dynamic duo created natural cleaning products that really work. My favorite product on the website are the Biodegradable Wipes. These wipes can be used on people (think baby wipe replacement) or for cleaning purposes. 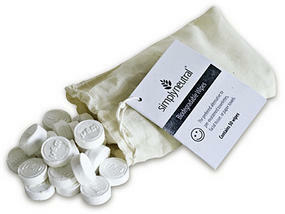 They are gentle, non-toxic, biodegradable, bleach free, durable and 100% natural. To expand the little disc, simply add a tablespoon of water. These are great to carry in handbags, diaper bags, the glove box, etc… The company carries a select few products (like these wipes) which are produced by other companies and filled a needed niche). The website also carries a variety of non-toxic household cleaners and concentrated refills. Company founder Maggie is the test person for all of the products carried. She has Multiple Chemical Sensitivity and has a child with Asthma, so it is vital that neither of them react to a product. During the creation process, Sara and Maggie wanted to find cleaning products that worked and didn’t contain dangerous chemicals. Eventually they landed on a corn sugar and palm kernal oil agent that worked, was biodegradable, non-toxic and safe for MCS and Asthma. “The cleaning agents we ultimately chose are derived from corn sugar and palm kernel oil. They biodegrade rapidly, making them safe for the environment. In fact, they’re so gentle, they’re ideal for people with asthma, allergies, and multiple chemical sensitivities (MCS). “- From SimplyNeutral’s website. These products are widely available at stores throughout Minnesota and a sprinkling of stores across the country. If there isn’t a store in your area, order direct through the website. I’m looking for help, recently my research for wet wipes actually its a part of my thesis report for me to become bachelor , I would like to know what are the safe and unsafe chemicals for wet wipes product. There are many good wipes in supermarkets,But I think i can make some good ones athome,using some natural materials.